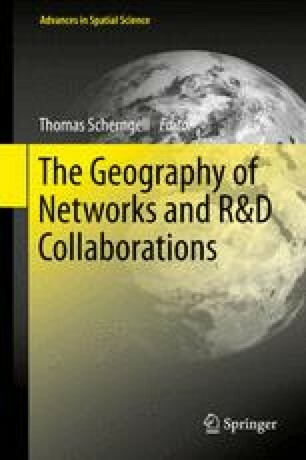 This study investigates the usefulness of exponential random graph models (ERGM) to analyze the determinants of cross-regional R&D collaboration networks. Using spatial interaction models, most research on R&D collaboration between regions is constrained to focus on determinants at the node level (e.g. R&D activity of a region) and dyad level (e.g. geographical distance between regions). ERGMs represent a new set of network analysis techniques that has been developed in recent years in mathematical sociology. In contrast to spatial interaction models, ERGMs additionally allow considering determinants at the structural network level while still only requiring cross-sectional network data. The usefulness of ERGMs is illustrated by an empirical study on the structure of the cross-regional R&D collaboration network of the German chemical industry. The empirical results confirm the importance of determinants at all three levels. It is shown that in addition to determinants at the node and dyad level, the structural network level determinant “triadic closure” helps in explaining the structure of the network. That is, regions that are indirectly linked to each other are more likely to be directly linked as well.